Recently there have been requests either in person or via the phone about Hubble contact lenses. Hubble contact lenses are contact lenses made from a private company that does their own manufacturing and shipping of their product. They use a moderate water content lens material that is for daily use only. The company seems to be marketing more and more as the contact lens has been on the market. The protocol to receive a contact lens prescription is having a contact lens fitting. A fitting consists of your eye doctor evaluating the fitting of the contact lens on the eye along with assessing your vision and the comfort you experience when wearing the contact lens. This needs to be done annually as all contact lens prescriptions are valid for one year. Some issues we have had are that the company has sent out boxes of lenses without valid contact lens prescriptions from our office or naming some of our providers as doctors who will fit Hubble contact lenses. This is not true however as we do not have a fitting set to use nor are we ordering a fitting set in the future and no contact lens prescription should be filled without a valid contact lens prescription. 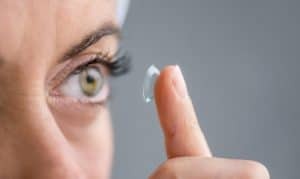 There are better options of daily contact lenses with higher water content and oxygen permeability either in our office as trials or that can be ordered. If you would like to have a comprehensive eye exam and you have worn contact lenses previously you can call to schedule a complete and contact lens exam today and any of our high quality Optometrists can fit you into the right contact lens for your eyes (860) 233-2020.